Facing a threat from the U.S. Justice Department, Colorado politicians have united to defend the marijuana industry. Although they have various reservations concerning recreational marijuana, Senators Cory Gardner and Michael Bennet, Governor Hickenlooper and Colorado Attorney General Cynthia Coffman all have opposed federal interferences in what is now a legal activity protected by the Colorado constitution. 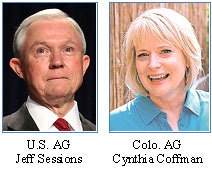 In an article in the Colorado Statesman by Brian Heuberger, Floyd Ciruli analyzed the conflict between Attorney General Jeff Sessions and Colorado’s senior political officeholders. “‘Politicians look at the polling, and public support points toward legalized marijuana,’ said longtime pollster Floyd Ciruli, found of Denver-based Ciruli Associates, a public policy, polling and consulting firm. Indeed, polls have demonstrated that Colorado officials are in agreement with the American public. For instance, a Quinnipiac poll indicated that voters support legalizing marijuana in the U.S. by a 59-36 percent margin and oppose federal crackdowns on marijuana states by a 71-23 percent margin. With all this support for legalized marijuana just in Colorado, would Sessions receive enough public support for a national crackdown on legalization? Ciruli has his doubts. The 2016 election was good for the legalization of marijuana. Four more states, including California, legalized recreational marijuana. The American Association for Public Opinion Research (AAPOR) May national conference will host a panel of leading national pollsters to examine the evolution of public opinion toward marijuana legalization. The change in opinion during the last few decades has been rapid, but there are still groups within the public highly resistant to the spread of legalization. I will chair a panel offering a series of papers describing the depth of that change nationally and within the key states of California, Colorado, Oregon and Washington. Recreational marijuana is on the move around the country. It was approved in four states in 2016 by mostly narrow votes and now is legal in states with more than 60 million people, or about 20 percent of the country. Pollsters will describe the shift in opinion favoring legalization, some of the future opportunities and road blocks it may face, and status of public opinion in states that approved it in 2012. A substantial majority of Colorado voters remain steadfast in their support for the legalization of recreational marijuana. But, there are numerous signs of stress and public resistance to its spread across communities and through the commercial process of manufacture to sale. Polling to capture the stress and in communities resisting its spread recommends different questions from those developed pre-legislation. Although most observers believe the education, experience, judicial record and hearing performance of Neil Gorsuch qualifies him for the Supreme Court, it is possible Democrats will oppose him as a party position. Apparently, he doesn’t qualify for an upper or down vote due to the anti-Trump resistance and anger over Merrick non-action. If Republicans remain united, a Democratic filibuster is merely a delaying tactic. 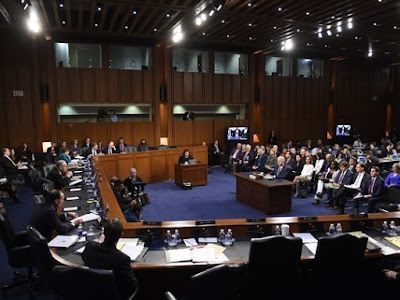 In fact, Senate President Mitch McConnell is so confident, he stated the vote will be on April 7. That may require ending the filibuster tradition for Supreme Court nominees, which the Republicans can do with their 52-vote majority. Democrats need 41 votes to stop a closure vote of 60. If eight Democrats vote with Republicans, the filibuster is broken. As of March 29, Democrats had collected 25 commitments for the filibuster. Ending the filibuster rule would be a major change in how the Senate operates and in its tradition of protecting minority positions. But in today’s polarized and hyper-partisan environment, it may be inevitable. will be a vote against a filibuster. But Jon Tester of Montana, Joe Donnelly of Indiana, Claire McCaskill of Missouri and Heidi Heitkamp of North Dakota are facing pressure to break from progressive interest groups and support a vote. A number of Senate veterans, including Patrick Leahy of Vermont and Dianne Feinstein of California, may also be a possible vote for closure. But as of today, the vote appears very close. Did the Polls Get It Right? National Polling Conference Review the 2016 Election. The American Association for Public Opinion Research (AAPOR) national conference will assemble some of the nation’s leading pollsters to review the accuracy and reporting of polls in the 2016 presidential elections. President Trump now regularly attacks polls he does not like, along with the media outlets that report them as fake and rigged. His patented riffs to delegitimize polls is to claim “the election polls were a WAY OFF disaster,” as he tweeted most recently attacking CNN. In fact, the poll reported was a Gallup Research poll showing Trump’s approval rating had sank to 37% after starting at 45% shortly after the inauguration. So, were the polls inaccurate November 8? Even if they were within the margin of acceptable error, were they misreported? Clearly, the nation’s political establishment and citizens were shocked by the result. A four-day conference in New Orleans on May 18-21 will deconstruct the 2016 election polling and reporting and propose improvements. The theme for AAPOR’s 2017 Annual Conference is: Embracing Change and Diversity in Public Opinion and Social Science Research. A polling post-mortem and related papers spawned by the extraordinary 2016 election. Latest research on survey methods, including non-response, question wording, questionnaire design, interviewers and interviewing, and sampling. Diversity: Public opinion and research on racial, ethnic, religious, gender and sexual orientation issues. Public opinion in shaping policy and debate on pivotal topics, like healthcare, immigration, income equality, marijuana and gun control. The Crossley Center will chair a panel on marijuana and public opinion change. Public opinion and survey researchers are working in a time of unprecedented change, challenge and opportunity. AAPOR’s annual conference is the premier event for researchers, practitioners and consumers of social data to present the latest materials and learn from one another. Peggy Noonan, an indefatigable optimist, continues to hope that Donald Trump is going to “pivot” and get a bipartisan deal on health care. She lacks realism. Democrats won’t help Trump or Republicans pass “repeal and replace.” Trump doesn’t appear to have “pivot” in him. But, does another disastrous week lead Trump and his team to look for some action that shifts attention from tweets, Russians and health care? Recently, we discussed immigration reform, an issue that would disarm critics, attract moderate Republicans and Democrats, and reduce deportations that will produce bad press for years. 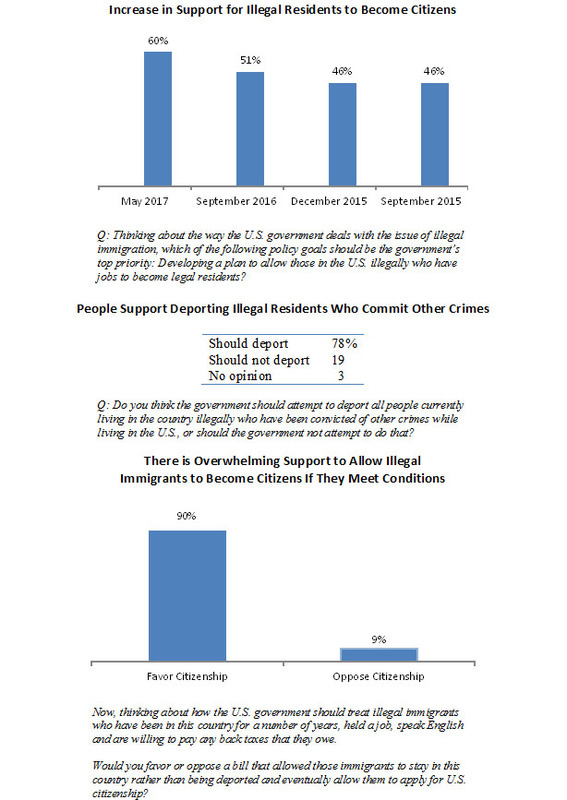 The latest CNN (ORC poll) confirms that there is a considerable upside for finding a solution to the status of undocumented residents. The public agrees with the President in deporting criminals, but rejects deporting all illegal citizens. 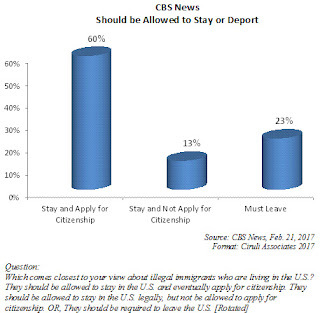 Ninety percent of the public suggests illegal immigrants gain citizenship if they meet strict conditions. The media continues to chase after any facts that might substantiate Donald Trump’s claim he was “wiretapped” at Trump Tower by the Obama administration. In additional tweets in the same series he claims it is equal to Nixon/Watergate and that Obama is a “bad (or sick) guy!” This has launched a three-week search for evidence to support the claim embroiling two congressional committees, the Justice Department, FBI and other intelligence agencies. But Trump’s view of credible evidence is largely determined by the narrative he is telling and selling. The wiretap narrative is a part of the alt-right view that much of the bad news and controversy of Trump’s first eight weeks in office is a product of a conspiracy to disrupt his administration and even possibly remove him. The coup d'état theory is the story Trump saw in Breitbart prior to his tweets. But the theory Trump was surveilled had circulated among the Trump Oval Office crew since the leaks that were responsible for the removal of Michael Flynn as head of National Security were published. In the Oval Office view the leaks are part of a massive conspiracy from Obama loyalists, Democrats and liberals in the bureaucracy, the legacy media and the deep state that is, military and security forces, to hamper his administration, or as Trump said in his wild Friday press conference, “The leaks are real, the news is fake (2-16-17). Trump believes he is being undermined every day. January 12 - Washington Post publishes there was a call (leak). Spicer – no sanctions discussed. January 23 - Spicer press conference. No sanctions discussed. European Populism Not Dead. It has Powerful Friends in America. Although the European establishment and the EU bureaucracy feels more secure after the Netherlands vote, the attraction of populism and nationalism remains strong in many European countries. It will next be tested in France. The EU establishment cites recent polls that show EU favoring candidates in France and Germany have been surging into tight leads. But, if one conclusion came out of the recent Donald Trump and Angela Merkel summit, it is that the Trump administration is pro-populist, pro-nationalist and anti-EU. Their meeting highlighted no consensus exists on trade or EU’s open borders. U.S. populist and nationalist money and online campaigning was spotted in the Netherlands. Expect behind-the-scenes support in France. Because Trump and his policies are an easy target for the European left, low-key campaigning will be the tactic. In terms of Germany, although Trump and his team would prefer a party of the right, Merkel is such an object of resistance that they would likely prefer any chancellor but Merkel, even a socialist. The sense of confidence for the European establishment or Brussels bureaucracy should be tempered by the challenges they face and the forces arrayed against them. And then there is, of course, the disinformation and aggressive campaigning of Russia. Former U.S. 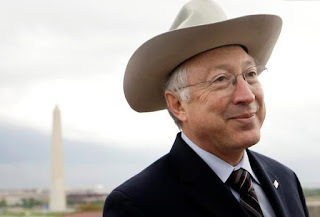 Senator and Interior Secretary, Ken Salazar, announced he would not run for governor of Colorado in 2018. Democrats are expecting their first primary for an open seat since 1998 when Mike Feeley lost to Gail Schoettler. She lost in a close race to Republican Bill Owens. The Democrats could lose this year if there is a divisive primary. In an interview with KOA’s Karen Trinidad, Ciruli said most observers weren’t surprised Salazar will not run. He’d made it clear that his family came first and that his legal career was important for his family’s financial well-being. A Colorado governor is one of the lowest paid in the country at $90,000 (48th lowest). Although he always said the governor’s job was one he would like and he would have been the frontrunner, this is not a year that he would have cleared the field. There is simply too much pent up ambition and there are serious divisions in the party between the Clinton and Sanders forces. The party is ready for a fight. Salazar was a Clinton person, known as a political moderate who had been out of the Colorado elective office since 2009. Next up will be Congressman Ed Perlmutter, who has indicated he’s interested if Salazar did not run. Perlmutter has several advantages, including a built-in fundraising machine that could raise millions and a strong voter base in his district. Both parties have run effective statewide races for senate from congressional seats, such as Cory Gardner, Wayne Allard, Mark Udall and Tim Wirth. Although he would give up a safe House seat, he’s been in the minority since 2011 and is likely to remain there. But even Perlmutter would probably not clear the field. Already running is former State Senator Mike Johnson with a strong, if not well-financed, campaign. An expert on education, he would be seen as centrist in a liberal party. On the leftwing, giving thought to running are Representative Joe Salazar and Senator Mike Merrifield. Numerous other names have been mentioned as a big field considers the race. Colorado’s 10th Circuit Court Appeals Judge Neil Gorsuch handled his Senate confirmation interlocutors well after the first two days of hearings. 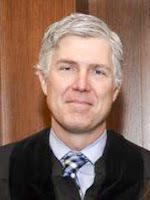 In an interview Wednesday, March 22 with KOA’s Steffan Tubbs, Ciruli said the problem is clearly not Gorsuch’s ability to answer questions, but Democrats continued anger on the lack of a hearing for Judge Merrick Garland and contribution of President Trump’s eight weeks in office to the Democratic resistance. 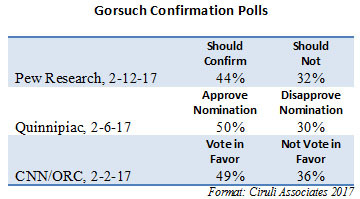 Gorsuch needs 60 votes to get a floor vote, and normally that is easily accomplished. This year it is likely to be a struggle. In a particularly difficult spot is Michael Bennet, who would normally, at a minimum, support having an up or down vote and possibly due to Gorsuch’s Colorado bona fide and sterling record vote to confirm. But this year it’s a tougher position for a senator who thinks about the presidency or vice presidency. This will be the most important week in the Trump presidency. Along with Gorsuch and the FBI Director Comey’s testimony, the health care bill will be voted on if 216 votes are lined up. As of Thursday night, the bill was postponed due to the failure of the President and Speaker Ryan’s final appeals to diehard conservatives. 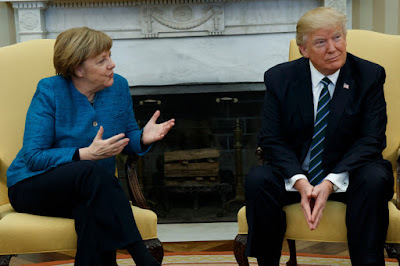 The Trump-Merkel Oval Office visit was frigid. No handshake and no consensus on the mission and scope of the Atlantic alliance. Donald Trump and his “America First” team are more interested in a Cold War with Germany and Western Europe’s establishments than with Russia. The difference in core issues and values were significant: immigration, NATO, trade and the EU. Migration, immigration, integration has to be worked on, obviously. Traffickers have to be stopped. But this has to be done while looking at the refugees as well, giving them opportunities to shape their own lives where they are; help countries who right now are not in an ability to do so -- sometimes because they have civil war. I think that’s the right way of going about it. Well, I believe that the President has clearly set out his philosophy as to what trade agreements have to bring about for the American side as well. I personally don’t think that Germany needs to negotiate and not the European Union. But the question is, will it be of benefit to both countries or not, and let me be very honest, very candid -- a free trade agreement with the United States of America has not always been all that popular in Germany either. First of all, I don't believe in an isolationist policy, but I also believe a policy of trade should be a fair policy. And the United States has been treated very, very unfairly by many countries over the years. And that's going to stop. On trade with Germany, I think we’re going to do fantastically well. Right now, I would say that the negotiators for Germany have done a far better job than the negotiators for the United States. But hopefully we can even it out. We don’t want victory, we want fairness. ...obviously, defense and security has a lot of different assets and facets to it. One the one hand, it’s supporting missions in Africa, for example. It’s also promoting development assistance, but it’s also helping mission in Africa, for example, in trying to stand up for their own safety and security. We continue to be in conversation. What was important for us today was that we were able to talk about Afghanistan, talk about, as the President quite rightly said, the continuing mission of Germany in Afghanistan. But the problem Trump has with Merkel is more political than policy. Merkel represents everything Trump doesn’t like, and he often says so. She is the senior European leader in power since 2005. She was close to Barack Obama; she leads Europe’s best economy with its most stable government. She is conservative, yet a globalist and the leading advocate of the EU’s conventions on open borders and a European position on trade. For Trump, what’s to like? And, during the campaign, he specifically used her as a rally shout out. In fact, she and Hillary Clinton were interchangeable. And, of course, his raison d'être issue, immigration, should sink her. Trump asks, why is she in my office? “Hillary Clinton wants to be America’s Angela Merkel, and you know what a disaster this massive immigration has been to Germany and the people of Germany. Crime has risen to levels that no one thought would they would ever see.” Trump said. “We have enough problems in our country, we don’t need another one,” the candidate said. However, neither Merkel nor the EU establishment should have any illusions. Trump represents a direct challenge to them and their vision. 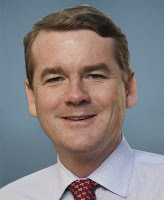 His support in Colorado has built among the legal and political community with Democratic and Republican politicians and lawyers endorsing his confirmation. His confirmation would likely be easier in these polarized times if President Trump could take a week off from his endless controversies, many of which are self-generated, and focus on his legislative agenda. 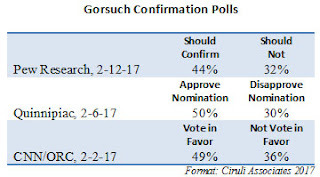 Gorsuch has been one of the few decisions he has made that has been well-received in the tumult of the eight weeks of his presidency. Much will depend on the next couple of weeks, especially Gorsuch’s testimony, but he at least approaches his hearings with a public ready to support him. He has from 20 to 12 percent support for confirmation. These tend to be tighter numbers compared to the previous confirmations due to polarization. The questioning makes clear this confirmation is becoming embroiled in the Democratic resistance and the Trump turmoil. Repeal and replace has Congress and Washington in its grip. Four new polls show some difference in the public’s support on the Republican House health care bill, but, in general, Republicans and President Trump are at risk, both from the possibility the bill fails, but also if a flawed bill passes. All four polls were conducted before the Congressional Budget Office finding that 24 million fewer people would have health insurance. In general, support for the current Republican plan is below 50 percent, and range from 34 percent in a Fox News poll to 46 percent in a Politico/Morning Consult poll. An equally large problem is the public’s sense that the Republican plan will cover fewer people and cost more. Hence, the new legislation, if passed, will have to deal with negative expectations at its start, much like Obamacare, which contributed to the replacement of Ms. Pelosi with Mr. Boehner in 2010. It may seem improbable, but Pelosi is still waiting for the gavel back. Immigration remains a powerful force in European electoral politics as just demonstrated by the Dutch electorate. 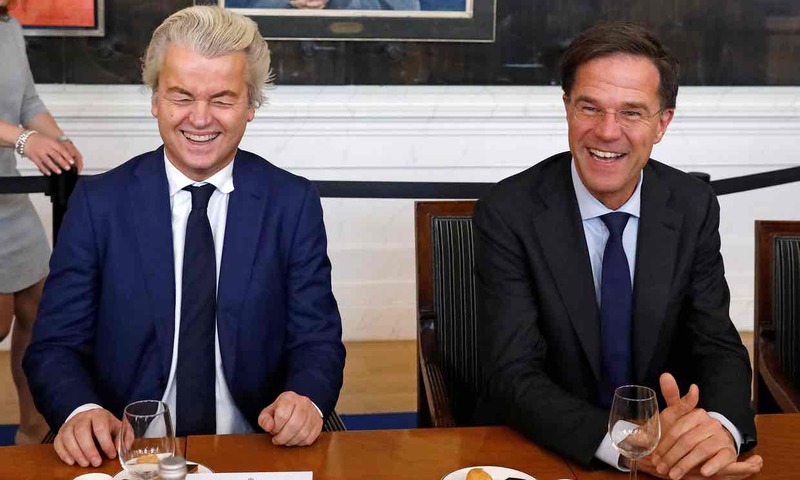 But, voters rejected the governing extreme of Brexit or the Trump/Bannon anti-EU, anti-Muslim policies that Geert Wilders espoused. Although his Freedom Party picked up a few seats in parliament, it was far less than expected. The current prime minister, Mark Rutte, of the center-right Peoples Party remains the largest and will assemble a coalition government. Rutte thanked his supporters for opposing the “wrong kind of populism.” He clearly moved right on immigration, but it was more rhetoric than policy. A record turnout with a surge of young voters was good for the green party, which increased its share of the vote to a record high. Populism, and its anti-establishment sentiment, can help both right and left. Immigration and nationalism will remain potent electoral strategy effecting the French (April 23 1st round) and German elections (September). But, voters appear to be pausing before jumping to the Brexit and Trump extremes. President Trump doesn’t need any more problems with Congress at the moment. His repeal and replace health care bill will likely not pass either house in its current form. But now the appropriation bill necessary for the operation of the Federal government until the fall is in trouble because Democrats are objecting to money in the bill for the President’s wall along with the U.S.-Mexican border. There may be a legislative compromise available, but for now, Democrats are claiming they would stop the “keep the government open” appropriation bill if it includes money for the wall. That may be overkill and Democrats could look “Ted Cruz” extreme, but they have picked an issue that has little public or Republican establishment support, although rank and file Republicans like it. 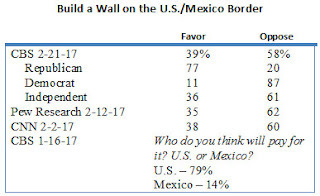 Unfortunately, Trump not only promised a wall, but also that Mexico would pay for it, and almost no one believes that. Hence, another promise is in some trouble. 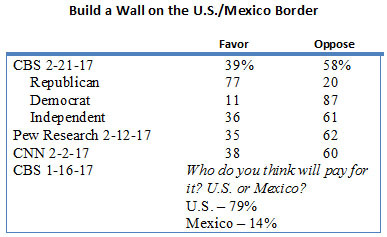 About 60 percent of the public opposes a wall and only 14 percent think Mexico will pay for it. 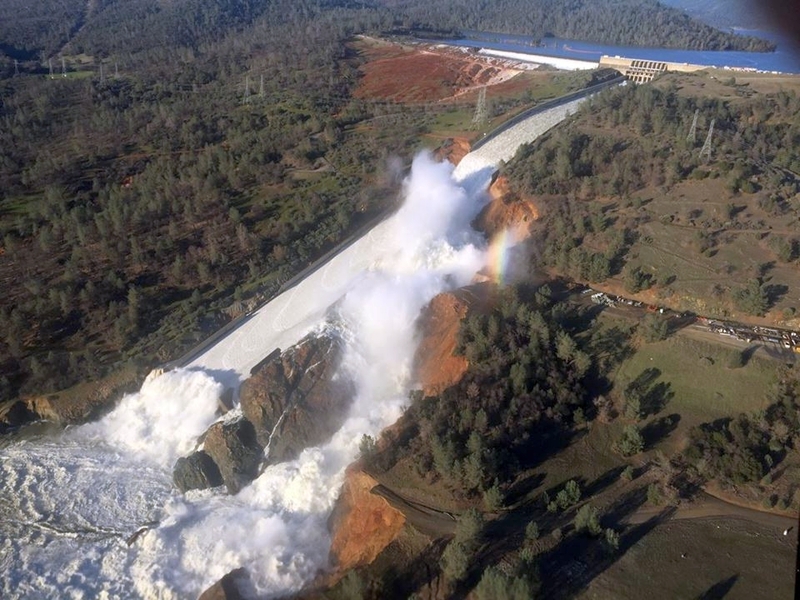 When Chicago Mayor Rahm Emanuel recently wrote to advocate for significant infrastructure funding, he started by discussing the Oroville Dam’s crumbling spillway, although he is mostly interested in transportation, airports and urban infrastructure. In the quest for infrastructure funding, water and extreme climate have an advantage. They have caught the public’s attention. Drought, flood, pollution, dam failures and the need for more storage are regularly in the news. Indeed, water is increasingly mentioned as part of the infrastructure appropriation planned in Washington. Scott Pruitt, the new EPA leader, in particular, is an advocate. The changes evident in Washington from the Trump administration and Congress should benefit the management and development of water resources. The administration wants to deregulate and focus on the EPA’s core mission. In addition, both Trump and Pruitt are strong advocates for states’ rights. For entities that have been dealing with the EPA, that would mean less federal intervention and more state involvement. Colorado and the western states should benefit from more deregulation and more money if they can get organized. The competition for funding will be significant. Colorado needs to develop a strategy, identify a list of projects, empower a state team and build the case for the state’s water investments. The good news is that Colorado has a water plan that identifies the state’s water needs and likely projects that can meet the need. By 2050, Colorado is projected to have a shortfall of 400,000 acre-feet of water that it needs to supply 1 million households. It will require $3 billion in water programs and projects to address the gap. 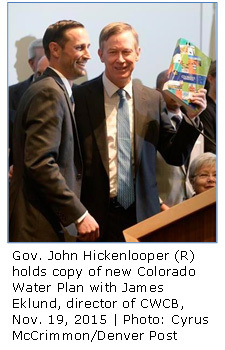 Also of benefit to the state, Colorado’s commitment to sound stewardship of water resources is apparent on many fronts. With more responsibility at the state level will come more scrutiny. Conservation through changes in residential usage, system improvements, reuse of water and conservation programs has become a priority for the state’s water agencies. The Environmental Protection Agency (EPA) will become considerably smaller and more focused on its core missions if the Trump administration has its way. The new Administrator of the EPA, Scott Pruitt, will manage an agency with an initially proposed budget reduction of 25 percent and with 3,000 fewer employees. Most importantly, President Trump is quickly ordering reviews of the Obama administration’s rules and orders. One week into the new administration, the new administration ordered a review of the Waters of the United States ruling – defining the scope of waters protected under the Clean Water Act – and said it will withdraw from fuel-efficiency standards and rescind rules limiting carbon emissions from power plants. Pruitt, who as attorney general of the State of Oklahoma often challenged EPA rules and regulations, is a strong believer in deregulation and shifting authority to the states. He was one of the states’ attorneys who sued on the Waters of the United States rule and helped tie it up in court. Where the administration has authority, it has moved quickly. President Trump reversed President Obama’s decision and approved the Keystone XL and Dakota Access pipelines during his first week in office. Pruitt will have allies in the departments of Interior (Ryan Zinke), Energy (Rick Perry) and Agriculture (Sonny Purdue – not confirmed) who share his goals of states rights and deregulation in departments now constrained by smaller budgets as federal dollars shift to defense spending. But much of what the EPA does in rules and regulations, including its aggressive expansion orchestrated by the Obama White House after the 2014 election, can only be undone through a carefully managed and legally guided process. Just as Pruitt used his state position to challenge, and in some cases, stop the Obama administration, Democratic states’ attorneys, environmental groups and others will be ready to litigate any reversal of rules and regulations. How much of Trump’s budget and administrative proposals are implemented remains to be seen. 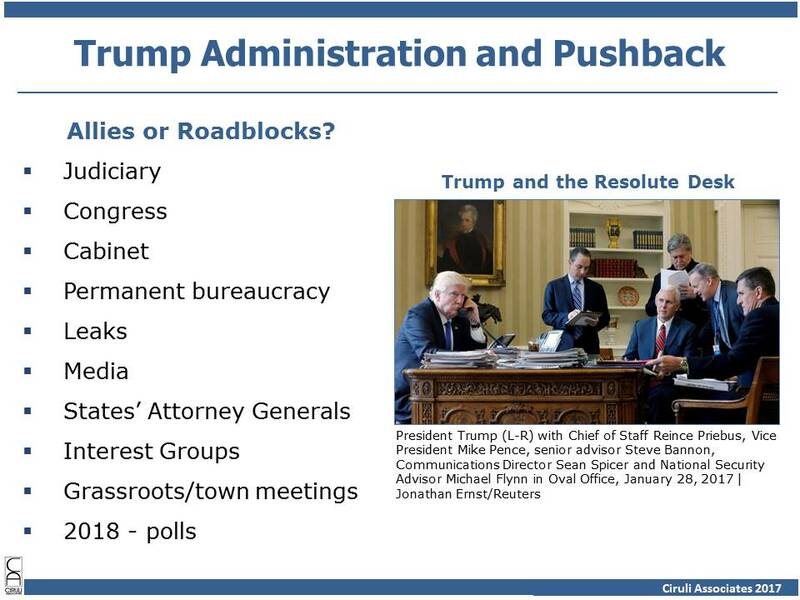 As the first eight weeks of the administration makes clear, there are a host of roadblocks to get around. The judiciary stopped the refugee rule. Meanwhile, Congress must enact the proposed budget and is struggling to find the votes for the Affordable Care Act repeal and replacement and for tax reform. The EPA, in particular, will face a mostly hostile bureaucracy, powerful environmental interest groups adept at lawsuits, administrative leaks, media attacks and substantial local activism. Justice and the EPA were President Obama’s most political agencies. Changing their direction will produce the most resistance. In an article in the Denver Post on Sunday, John Wenzel describes the good news for regional arts and cultural organizations. The Scientific and Cultural Facilities District (SCFD), which provides a financial lifeline to the 300 organizations, has increased revenue to distribute. The organization has helped make Denver one of the nation’s top areas for performing arts attendance. At the moment arts funding in Washington D.C. is threatened with extinction, nearly two-thirds of Denver area voters supported a 12-year renewal of the SCFD. The funding provided for local cultural facilities and programs increased from $36 million in 2004 at the last renewal to $56 million today. The program is a national model for local arts funding, but has been seldom duplicated. The program’s success with Colorado taxpayers and opinion leaders reflects its careful governance, localized grant decision-making, and strong incentives for providing access to families and children of the entire region. It has a formula that works. Congratulations to the SCFD on its 2016 victory and its 29 years of operation. 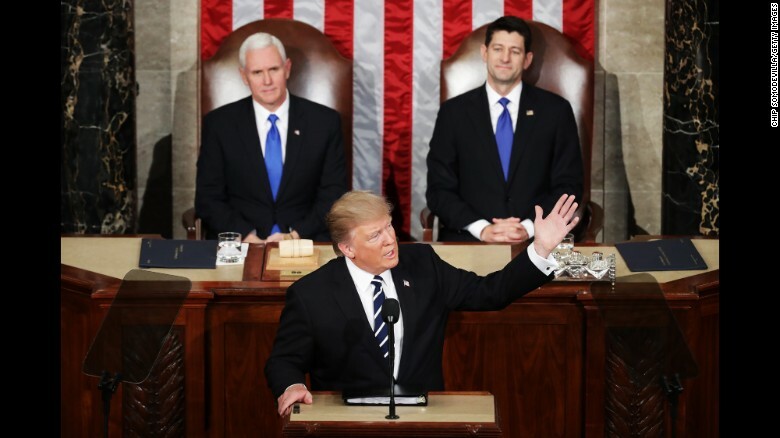 President Trump referenced that some type of solution was possible for millions of undocumented residents if they do not have criminal records in an interview on the day of his Joint Session of Congress speech on February 28, 2017. That was a change in position for Trump and the administration. Of course, it may not have been a serious proposal. The administration is currently conducting deportation raids against all undocumented because their status is prima facia illegal. “We are just upholding the immigration law.” And although Trump has stated that the focus is on apprehending criminals and drug and gang members, numerous stories made clear that many of those deported are guilty, at most, of minor offenses, such as failing to have a driver’s license or misuse of a Social Security Card to obtain work. In other words, prior to the statement by Trump, it was assumed that most undocumented residents were subject to deportation. The administration was slated to hire 15,000 additional immigration employees to implement the new sweeps. Resistance to this approach is significant, both from elected officials and the public. If the President wanted to support an immigration reform bill, he’s greatly increased bargaining power of the anti-immigration position, i.e., in favor of more stringent conditions. The American people would welcome a solution that avoids mass deportations, endless conflict among political jurisdictions and stories of family hardship. Polling done by our firm and others show that the majority of the public believe that immigration proposals of recent years requiring long waiting periods, speaking English, paying taxes and having no criminal record were popular. Only about a quarter of the population believes in expulsion, but it tends to be concentrated in the conservative wing of the Republican Party. Donald Trump and Paul Ryan are in deep trouble. Health care repeal and replace is a promise that must be delivered. Much of their support is based on the belief they can deliver certain key promises. And critically for their power, the business community has ignored the distracting tweets and out of mainstream views in hopes tax reform, infrastructure spending and deregulation would be the upside for tolerance. Health care reform was not the corporate and business crowds’ top priority. It was forced front and center by the Republican political leadership as long promised and doable given the repeated overwhelming votes to repeal in the House since 2011. Trump changed the game. He insisted that the popular aspects of the program stay in place and that repeal and replace pass at once. He was operating as a politician, not an ideologue. But the Republican Party has a surfeit of health care ideologues: Tea Party, Freedom Caucus and Rand Paul Libertarians who do not believe in any health entitlements and resist subsidies for the poor. They want to replace Obamacare and then pass some market-oriented measures that are likely to leave many gaps and many sympathetic stories of citizens left bereft of support. Many of them will be Trump voters. If the gridlock of the last six years now continues with Republicans in total control, the raison d’être of the Trump administration and Republican majority begins to crumble. 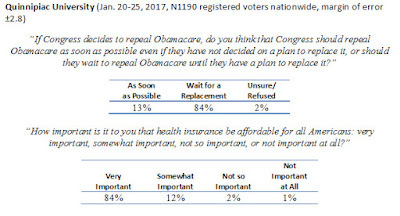 As pointed out in recent blog, Absence Makes the Heart Grow Fonder, Obamacare has grown more popular as it appears threatened and President Obama is no longer the chief defender of it. Recent polling associated with Obamacare show that the Freedom Caucus and Tea Party viewpoint of no right to health care and no subsidy for the poor are narrowly held positions among the public. 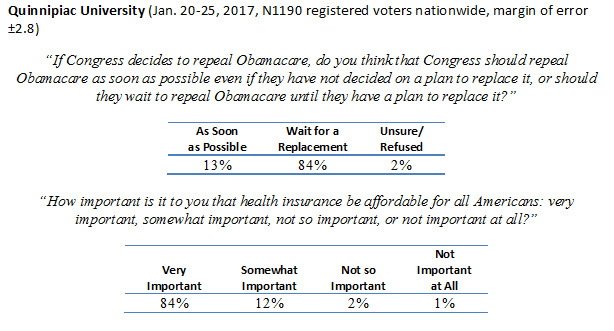 The public supports Trump’s and Ryan’s view that a replacement plan must accompany the repeal. They also believe insurance must be affordable. The public in general believe there is a “right” to health care. The view that government is responsible for it has grown in recent years. Russia and Vladimir Putin are now toxic in Washington, D.C. 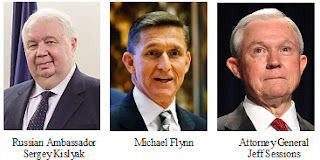 Even having a conversation with the Russian ambassador can get a person fired (Michael Flynn) or recused (Jeff Sessions). That was hardly the plan on Election Night when Putin and his entourage were reportedly toasting the result with champagne. Putin’s aggressive propaganda campaign continues most of the old Cold War techniques, but adds cyber warfare against Western democracies and especially the U.S. election. The motivation appeared to help remove a political irritant, Hillary Clinton, and assist a friendly Donald Trump, who was disinterested in Russian ambitions in Eastern Europe, the future of the EU or NATO, the removal of Bashar al-Assad and human rights issues in general. A tertiary benefit was undermining confidence in American democracy. But, unfortunately for Putin, he and Russia have become pariahs in Washington. Even normal diplomacy is now disrupted. 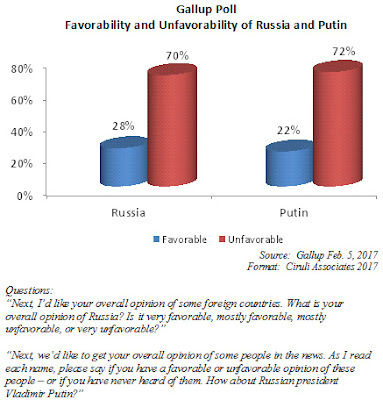 Both Putin and Russia are at all-time lows in public opinion, which will help their opponents to continue and extend sanctions and spend prodigious amounts on defense, much of it aimed at Russia And, of course, there are new multiple investigations of Trump’s Russian connections, plus the cabinet and NSC appointments do not bode well for a thaw in U.S.-Russian relations. Putin is giving a modern update to the definition of Pyrrhic victory. The Trump rally that broke through 20000 on January 25 was losing some of its momentum as the administration appeared diverted into side issues and Congress and Republicans became increasingly divided on health care and taxes and anxious for direction from the White House. 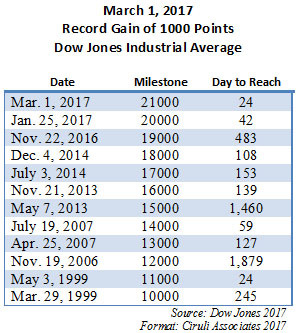 President Trump’s well-received February 28 speech to the Joint Session of Congress was exactly the boost the market needed to break through the 21000 DOW milestone, done in a record 24 days. The market jumped 303 points and closed at 21115 on March 1. The nearly 15 percent DOW climb since Election Day confirms that there was significant investor confidence being restrained by President Obama and Democratic Party economic policies. The investor and entrepreneurial community have reacted positively concerning Trump’s proposed regulatory relief, tax rate reductions and stimulus expenditure. The unified Republican government dramatically increases the probability it will happen and Trump’s business cabinet appointees reinforce the optimism. Hence, the most significant risk was Trump’s off-key behavior and the administration’s mixed five-week performance. Wednesday’s breakout was preceded by 12 up days in the DOW. 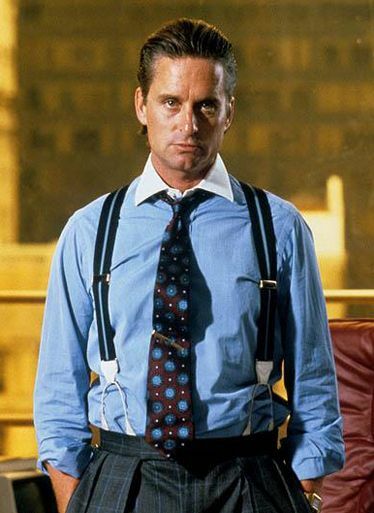 The last time we had 12 days of continuous up markets was 1987, the year the movie Wall Street debuted (“Greed is good, money never sleeps”). Other factors driving the confidence is a strong underlying U.S. economy, stable oil prices, moderate Fed interest rate increases and a good earnings season. Rallies don’t last forever. The 59-day boost in 2007 preceded the Great Recession and 24-day run in 1999 was followed by the Dot.com bust. The length and duration of the Trump rally is to be determined. President Donald Trump pivoted, if not in substance, at least in tone and language. Gone in this address was the dark “carnage” references, the narrow nationalism of “America First” or edgy attacks on media and opponents. The shift was timely. He accomplished about all he could in signing events around the Resolute Desk. Republicans, market investors and impatient voters needed to see if there is a more typical political leader with management and legislative skills within the effective showman. He passed the test. The reset button was hit. Polls showed his performance up to this point left voters nervous. They liked the possibility of change and keeping promises, but questioned the language, distractions and erratic performance of the first five weeks. In fact, a public opinion poll prior to the speech suggested containment, a foreign policy term applied during the Cold War to describe efforts to restrain the bad impulses of perceived adversaries and their expansionist, destabilizing activities, could be applied to Trump’s White House. 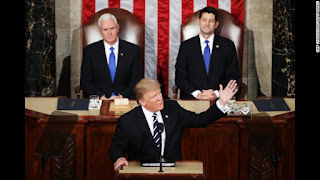 Democrats, of course, want to contain President Trump, but in a Politico/Morning Consult February poll, 37 percent of Republicans who favor the President and many of his programs want Republicans in Congress to act as a restraint on him. 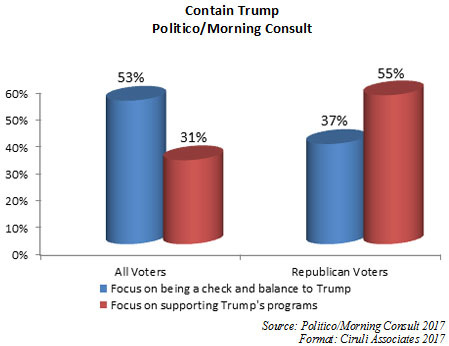 More than half (53%) of the public at large want Congress to be a check and balance on Trump. Trump’s performance will, no doubt, provide a bump. Republicans will be relieved by the tone and focus on the legislative agenda. Trump, for all the hostile criticism, is a voracious consumer of cable news, polls and audience feedback. Tuesday night should provide some reinforcement for the new approach. But the question is can he sustain it?